While traveling home last weekend to see my mother, I spotted someone on the plane researching “How to be healthy.” When you think of aspects of healthy living, items your doctor might prescribe are eating well, getting enough sleep and exercising. Yet, I doubt you added telemedicine on your healthy lifestyle mental list. With new technologies and doctors starting to embrace the trend, a prescription of telemedicine will most likely become part of your healthy lifestyle at home and work. Once home, I thought about when I first told my mom about my position at Chiron Health, a telemedicine company. Her reaction to this announcement depicted one similar to finding out that NASA had chosen me to be the first person sent to Mars. Despite her confused reaction, she is like a lot of individuals – not the most “tech savvy” and completely unfamiliar with the idea of telemedicine. Being in a Client Success role at Chiron Health, I speak to providers who have encountered similar hurdles with some of their patients who are weary of this “NASA-esque” technology. To put this in perspective, my mom called me a few years back in tears over not being able to figure out the touchpad on her new laptop. After about 30 minutes of trying to talk her off the ledge, I told her to go ask our tech savvy neighbor to help (who happened to be 7 years old at the time). Since then, my mom has really progressed since that frightful moment, but she still has her doubts when it comes to technology. My mom, like a lot of people, has a longstanding relationship with her primary care physician back home in Indianapolis who she routinely sees in-office. Despite their long-lasting relationship, I am positive there are times where he would rather her request a telemedicine appointment instead of making a trip into the office. A perfect example would be “I ate berries and now I have hives!” A virtual visit with her doctor on her new iPhone would be a better appointment fit (as a side note, this was a prior existing condition, she has had the same allergy since she was a kid). Bless his heart! Further, her primary care physician is a very progressive doctor and loves the idea of using technology to increase patient satisfaction and help manage patients’ day-to-day health (whether his patients are ready for it or not). Many providers I work with here at Chiron have similar feelings. From managing chronic conditions, to discussing treatment plans and tackling the daily challenges we all face to be healthier, telemedicine is a convenient way to provide effective health care. While some patients are more than ready for this new technology, some, like my mother, need more education and a ‘doctor’s orders’ approach to adopting telemedicine. Telemedicine adoption all boils down to patient comfort level. The last thing my mother’s physician would want is for her to feel uncomfortable with the level of care he is providing. My mom might have her doubts with technology, but she wholeheartedly trusts in the advice from her doctor. Whether she would be excited for a virtual visit is still up in the air, but the level of trust she has in her doctor would ultimately convince her to adopt this new healthcare technology. Recently Chiron Health published a blog post that outlined the process of explaining telemedicine to patients. First, it is important to explain to patients what telemedicine is – the practice of using technology to evaluate, diagnose, and care for patients at a distance. It also is important to give patients some context. When will patients be using telemedicine? For what types of appointments? Once they have a greater understanding of telemedicine in general, you may then relay the benefits for the patient. Some of these benefits include no transportation time or cost, no time off work, eliminating child care issues, etc. 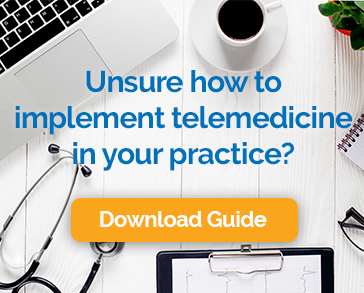 Addressing privacy and security as well as insurance coverage for the patient is a way to help them get on board with telemedicine in your practice. Although there are many individuals out there with the same stance on healthcare technology as my mother, education on telemedicine can help patients feel more comfortable and lead to higher video visit appointment volumes. This is where Chiron Health is here to help. Take a look at some of our great resources specifically for patients and what they can do to make themselves more comfortable with video visits. There are a lot of things, as a country, that we are still unsure about for 2017 but telemedicine adoption is not one of them. With better access to care, patients and providers alike will be using telemedicine as a way to help foster a healthy lifestyle from the comfort of their home. The oldest patient that one of our clients saw via video was 88 years old, which proves that telemedicine works for both young and older patients alike are moving towards telemedicine.